Necromancer Sy York and former detective alpha wolf Dakar Rhodes are slowly learning to merge their lives together as true mates. With the steadfast Brock and loyal Brad as well as Connor and Clive all sharing the estate with them, for the first time in his life, Sy feels as though he has a family around him. But just as Sy starts to get used to his new life, an uninvited guest to his party brings trouble to the family group. Sy's father has been scheming in the background for 10 years and arrives complete with Sy's new bride. Just as Sy remembers from when he was growing up, his father flatly refuses to accept Sy and Dakar's mating, and an angrily thrown power ball is just the start of the couple's problems. To add mayhem to a volatile situation, Dakar isn't handling the threat to his mating very well. Dakar knew Sy was more powerful than him from the moment they met and has told himself a dozen times a day it didn't matter. But a person's inner thoughts have a way of exposing themselves, especially when magic users are involved. Angry and frustrated, Dakar lashes out - could this be the end of his and Sy's mating before it even has time to settle down? Ghostly grandfathers, scheming family members, new mates, and a meddling mother-in-law; this audiobook has it all. 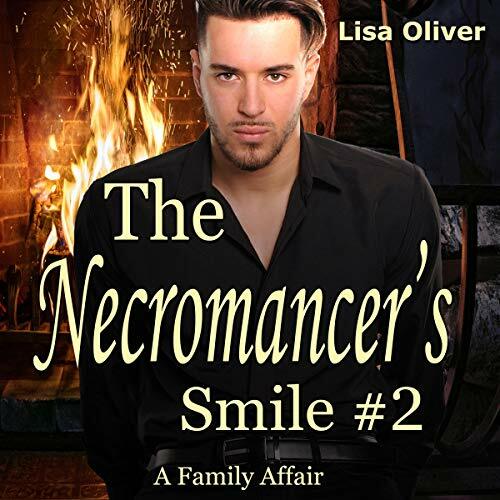 Please note this is the second audiobook in the Necromancer's Smile trilogy. The epilogue in this story is the prelude to audiobook three and starts the thread of a new plotline. Because of this, some might say that this does end on a cliff-hanger, although the story line in this audiobook is resolved. You will need to listen audiobook one before listening to this story. This audiobook includes M/M, HEA, and intimate situations between male adults, along with some violence and coarse language. Not intended for people under the age of 18. I've got to be honest, this book was a struggle to get through. Book one of this series was okay, but this one sounds like it was written by someone who's very inexperienced. The two main characters are totally unrelatable. They don't respond to situations in ways that are believable and are prone to lengthy bouts of emotional monologuing. But that aside, it could have still been passingly interesting if the narrator didn't make me want to grit my teeth. I dealt with it in book one because I was at least somewhat interested in the plot, but in this one it was the final nail in the coffin. He speaks like he's a robot doing a poor imitation of how real humans speak, which is made worse by the script he was given and the fact that he doesn't know how to use correct intonation and that he repeatedly mispronounces common words that children could get right. Overall, this is a total flop. I loved the first book in this series and it wasn't audible. The tale between the wolf and necromancer and all they went through was exciting, loving, and kept you guessing. Looking forward to the next book.